If we ate the rich we’d soon become vegetarians … because Malthus. Donald Trump’s government has not yet taken power, but its epitaph may have already been written. 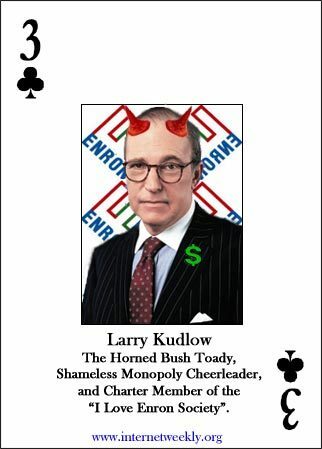 The author, Lawrence Kudlow, is a noted voodoo economist and the reported leading candidate to head the administration’s Council of Economic Advisors. Kleptocracy (from Greek: κλεπτοκρατία, klépto- thieves + -kratos rule, literally “rule by thieves”) is a government with corrupt rulers (kleptocrats) that use their power to exploit the people and natural resources of their own territory in order to extend their personal wealth and political power. Typically this system involves the embezzlement of state funds at the expense of the wider population, sometimes without even the pretense of honest service. 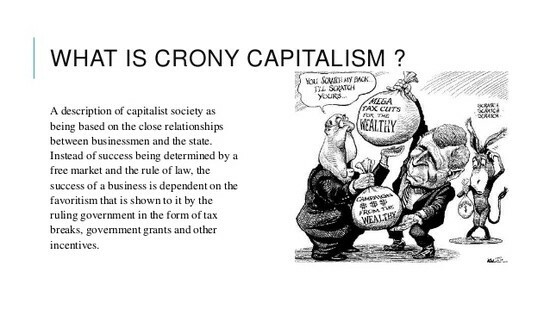 Crony Capitalism and Kleptocracy will be now operate as open as in the glory days preceding the Great Depression and in the years following the failure of Reaganist “supply-side” policy and the national flirtation with neoliberalism. That deregulatory fascination and the deficit spending on real wars gave us the Great Recession from which Kudlow thinks we can spend our way using trade wars at the very least. 1. Abuse of the System –Wherever there is freedom, there are people who will take advantage of and abuse the freedom. Some of the possible abuses in a capitalistic society include corporations using unfair practices in the labor field. Paying less than they should for the cost of living, and not allowing unions, having unsafe conditions to work in, are some examples. 2. 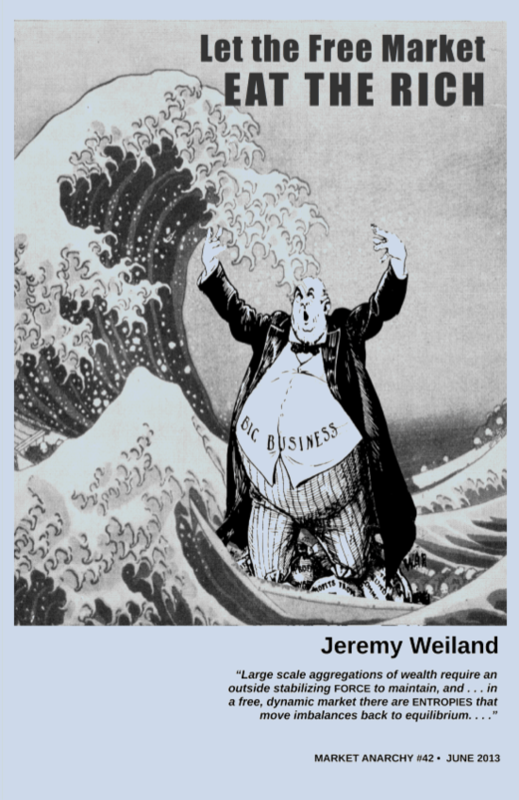 Mega Companies Can Take Over –There are many small and privately owned companies in a capitalistic society, but when corporations grow and become huge, they can crowd out, buy out, and even push out, the smaller companies. This not only affects the small companies, but also individuals because when mega companies take over, prices are sure to go up and products limited. 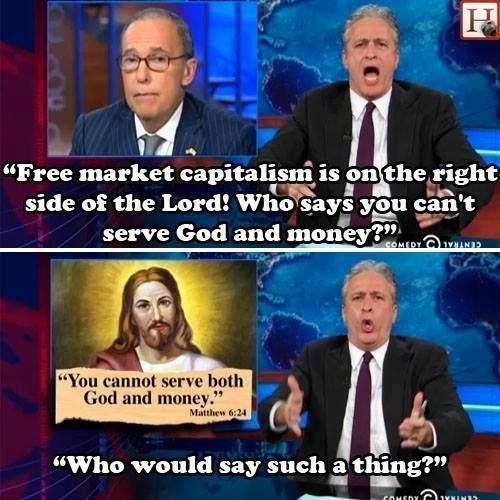 Robert Reich has something to say about the supply-side economics that is the linchpin of Trumpism, rendering Kudlow to his real role as pundit. Arthur Laffer will probably be the the final choice for CEA chair since he’s probably the most senior and actually qualified person who could admit to supply-side beliefs, claiming that Trump’s proposed tax cuts will bring “Nirvana”. Just about every week now I’ve been appearing on Larry Kudlow’s CNBC TV show… I debate Steve Moore, from the editorial board of the Wall Street Journal. Larry is a card-carrying unrepentant supply-sider who still believes low taxes lead to faster economic growth, which trickles down to everyone. Unfortunately for Larry, supply-side economics is one of those rare economic theories to have been tried in practice (the Reagan administration was the last full-fledged experiment) and failed miserably. By the end of the Reagan years, the federal budget deficit had ballooned and the only thing that trickled down was debt. The first George Bush was forced, finally, to raise taxes (despite what people may have read on his lips) because the bond markets were in full-scale revolt. By the time I got to Washington at the end of 1992 as head of Clinton’s economic transition team, the U.S. budget deficit was $300 billion a year as far as the eye could see. Alan Greenspan made it quite clear that unless we raised taxes, cut spending, and brought the deficit under control, he and the Fed would keep interest rates high to avoid inflation. The rest is history. Clinton reduced the deficit, Greenspan cut interest rates, and the nation enjoyed the longest and most powerful economic expansion in history, including 22 million net new jobs and wage hikes for almost all Americans. But now little Bush is doing another Ronald Reagan. He has cut taxes, especially on the wealthy. As a result, the deficit has exploded, median wages are stuck in the mud, the Fed is now busy raising rates, and we’ve had the most tepid economic expansion in thirty years. But none of this seems to dampen supply-siders enthusiasm. Every time I’m on the show, Larry claims all is well with the economy and urges Bush to cut taxes even more. I admire anyone who can stick to his guns when the guns are aimed at his foot. What has been exposed is not only the lie at the heart of Trump’s campaign, but a delusion embedded in conservatism itself. Conservatives like to imagine that their policy represents a challenge to the power structure, which they see as “crony capitalism,” a form of corruption threatened by their free-market ideas. The failures of the Bush administration (which, in fact, followed the tax-cutting, deregulatory agenda that conservatives had promised would usher in prosperity) were dismissed as the byproduct of the administration’s departures from market purism. Bush and the Washington Republicans allowed power and wealth to corrupt them, the argument went. As Bush’s popularity plunged, conservatives lacerated their party with polemics like Matthew Continetti’s “The K Street Gang,” which depicted the GOP as a self-enriching elite. The conceptual distinction between the good kind of wealth, earned through the free market, and the bad kind, earned through political favoritism, is an absolutely vital one for right-wing intellectuals. And yet Trump is showing how easily it collapses in practice. Conservatives have treated a first family using the powers of office to enrich itself — not theoretically or in the future but right now, on an ongoing basis — as, at worst, a distraction or a problem of optics. 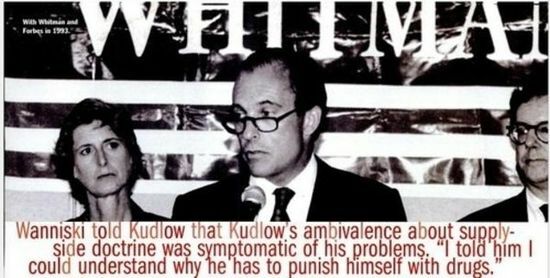 In practice, conservatives share Kudlow’s belief that a government of and by the rich is necessarily virtuous. The events that led to Donald Trump’s election started in England in 1975. At a meeting a few months after Margaret Thatcher became leader of the Conservative party, one of her colleagues, or so the story goes, was explaining what he saw as the core beliefs of conservatism. She snapped open her handbag, pulled out a dog-eared book, and slammed it on the table. “This is what we believe,” she said. A political revolution that would sweep the world had begun. 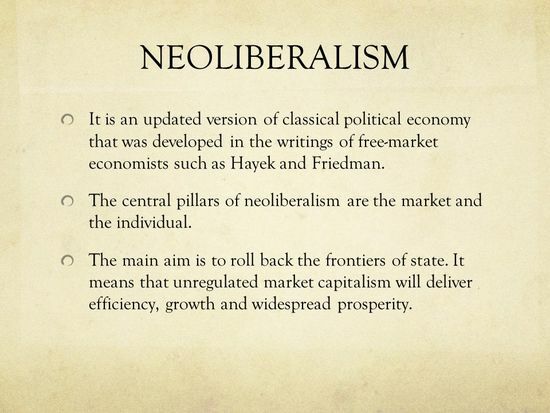 The philosophy was called neoliberalism. It saw competition as the defining characteristic of human relations. The market would discover a natural hierarchy of winners and losers, creating a more efficient system than could ever be devised through planning or by design. Anything that impeded this process, such as significant tax, regulation, trade union activity or state provision, was counter-productive. Unrestricted entrepreneurs would create the wealth that would trickle down to everyone. In the 1960s, usage of the term “neoliberal” heavily declined. When the term was reintroduced in the 1980s in connection with Augusto Pinochet‘s economic reforms in Chile, the usage of the term had shifted. It had not only become a term with negative connotations employed principally by critics of market reform, but it also had shifted in meaning from a moderate form of liberalism to a more radical and laissez-faire capitalist set of ideas. Scholars now tended to associate it with the theories of economists Friedrich Hayek and Milton Friedman. 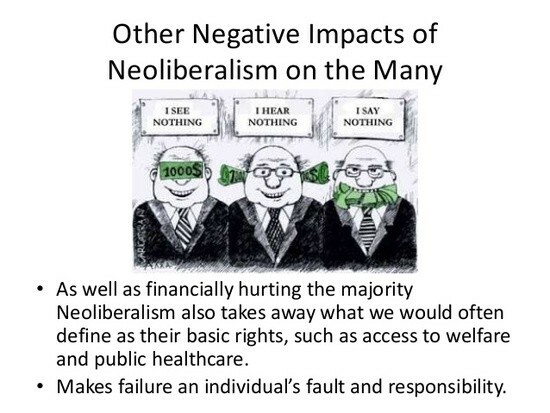 Once the new meaning of neoliberalism was established as a common usage among Spanish-speaking scholars, it diffused into the English-language study of political economy.Scholarship on the phenomenon of neoliberalism has been growing. The impact of the global 2008–09 crisis has also given rise to new scholarship that critiques neoliberalism and seeks developmental alternatives. The blue line shows you tax receipts on corporate income divided by GDP. The red line is real GDP growth. Now Mr Laffer claims that cutting taxes leads to higher GDP and hence more tax income, so that the tax intake of the government will not decline even though rates have been cut…. Laffer’s trickle-down economics did not do well empirically. Whether a cut in taxes stimulates the economy is a different question, and also any changes in tax rates might be overcompensated by changes in government spending taking place simultaneously. This, I believe, was part of the bait-and-switch under Ronald Reagan (tax cuts for the rich, but huge increase in government spending on defence) and will be part of the Trump policy, too. Nothing new here. This entry was posted in 2016 Election, Capitalism, Celebrity, Economic Policy, Economics, Financial, George H.W. Bush, Government, Government Propaganda, History, Internet, Media, Neoliberals, Political Science, Politics, Presidential Elections, Propaganda, Ronald Reagan, Sociology, Uncategorized, United States, Wall Street and tagged Conspiracy Theories, Crony Capitalism, Donald Trump, hayek, Journalism, kleptocracy, kudlow, Media, neoliberalism, Politics, Trickle Down Economics. Bookmark the permalink. I think a comment intended as a response to this article was mistakenly posted at ON THIS DAY: December 27, 2016, and started a thread there. perhaps, but actually it was hard to see the relevance since it seemed to have an ideological ax to grind but I’m glad that Chuck cited Jerome Bruner’s studies at Yale, and issues of confirmation bias.